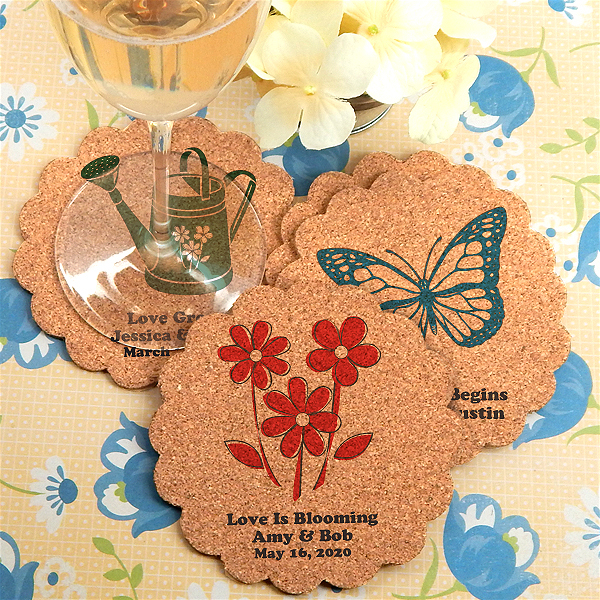 Classic, cute and dainty, the scallop shape of these personalized cork coasters are every bit as unique as you are. What better way to commemorate a special event than with a favor that reflects the attention and care that you’ve put into planning it? These coasters are perfect for weddings, baby showers, birthday celebrations, and so much more. Put them out on the table tops at your big event or send them home with guests to use again and again. These coasters are crafted from durable, 100% renewable, all-natural cork - an environmentally, truly sustainable material that absorbs moisture and protects surfaces from hot and cold temperatures. 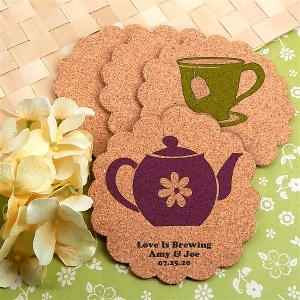 Since these cork coasters are all-natural, they can vary in color and thickness. With no expensive set up fee and low minimums, these coasters are affordable for any budget. Each beautiful coaster (4”) can be tailored to fit any event with up to 3 lines of personalized text, 15 color options, and an astonishing variety of design icons all printed using a proprietary eco-friendly printing system. Choose from a vast selection of designs including vintage, classic, rustic, shabby chic, beach, retro and garden. Your guests will love the functionality of this coaster favor and will remember you and your event every time it’s put to use.